If you are addicted to the new Elder Scrolls V: Skyrim game created by developer Bethesda, and just can’t get enough of the questing even when you’re at work or college. You might be pleased to know that an unofficial version has now been created for Texas instruments TI-84 calculators. 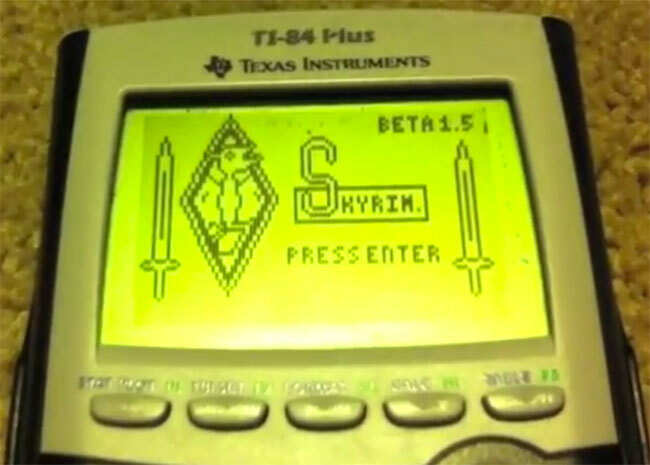 The new Skyrim modification has been completely built on a calculator by YouTube userno9sniper. As you would expect the game still includes questing and battles, but has scaled down graphics to accommodate the smaller processor. Watch the video after the jump to see the Skyrim game modification in action. If it’s something you would like to load onto your Texas Instruments TI-84 model graphic calculator, nosniper has kindly made the program available to download for free. To grab a copy jump over to the Media Fire website.